They all smell really nice! I have Tuesday and Wednesday off this week. We might go to the flea market. My mom called me the other night and I printed off several pages of text from this blog and some pictures to send her today. 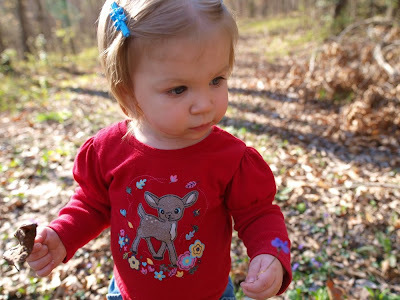 We're getting a set of dollhouse dolls in the mail soon for Esme - interested to see what she'll think of those. Extra note: Esme has shown us she can open the lever-style doorknobs in the house now. She can't always get them, but if she tries enough she can. Oh boy! Good thing the 'to the outside' doors all have round knobs! Last night Esme was adamant about going outside - even though it was dark out. She brought me her shoes, and brought Mark his shoes, and then I got one of each of my different types of shoes. Besides clinging tightly to my legs she definitely enjoyed the warm night outside. She had a great time looking and pointing at the stars and being carried around so she could stare at the sky without falling over. I kept talking to her how things were the same things we saw in the day, but this was what it was like 'in the nighttime, in the dark.' 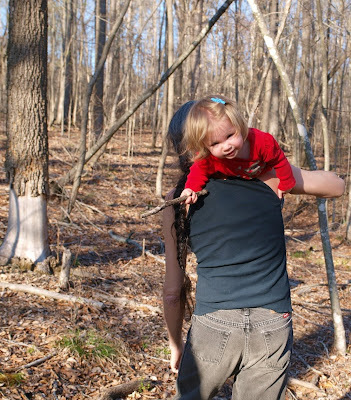 As I carried her around saying these things I felt a special moment was going by - something that would never quite happen again. 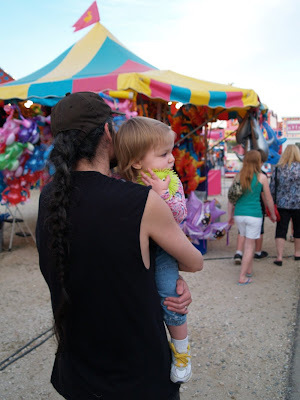 From the moment we walked into the Carnival Esme pointed and said 'whee' and 'wow' at all the lights and rides flying through the air. We walked around looking for a bouncey castle or something like that - but they didn't have one. So we decided to try the Ferris Wheel. 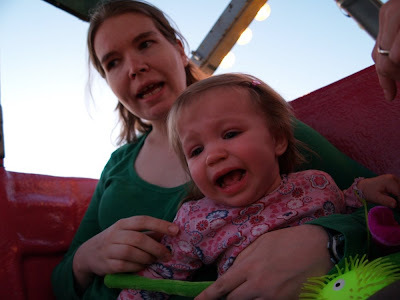 Esme was SO scared at first and crying - but about halfway through the ride she started to calm down. 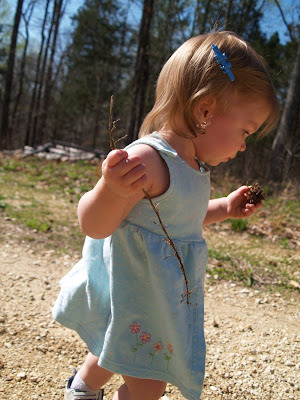 She looked at everything around us and to me saying 'pretty' and repeating her 'whee' and 'wow'. She gave us the most quizzical expressions! I'm not sure if I can believe you! 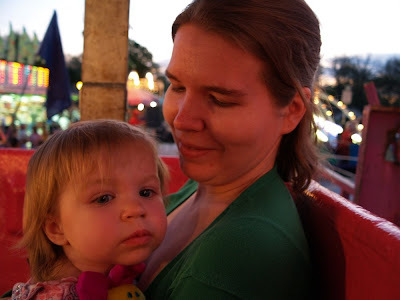 Then, while clinging tightly to me she relaxed completely and seemed to partially enjoy the rest of the ride. 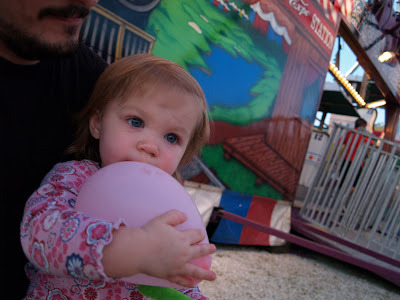 She didn't like it at all when I went on a ride and she stayed with Daddy - she cried loudly thinking I was gone. I heard 'DaDa!' and she hugged me tightly when I came back. 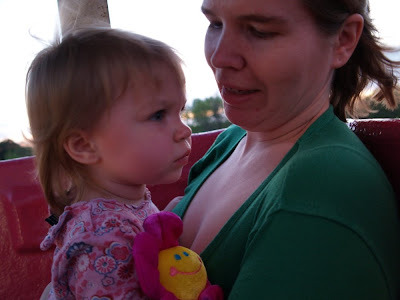 We took her on the giant slide and that was more fun - but the carousel made her scared again. We got a slice of pizza which was excellent (surprising) and Esme enjoyed that. 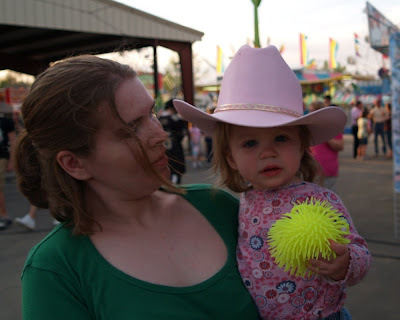 She also grabbed a Koosh ball from a vendor stall so we bought it - and we won a plush flower at a dart game. 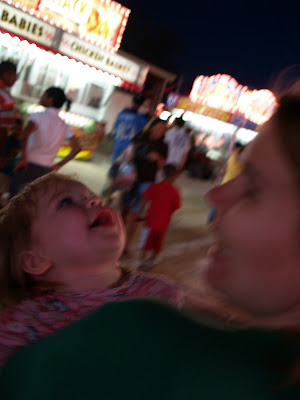 When we left we were halfway across the parking lot and Esme turned and waved 'bye bye' to the lights of the carnival. 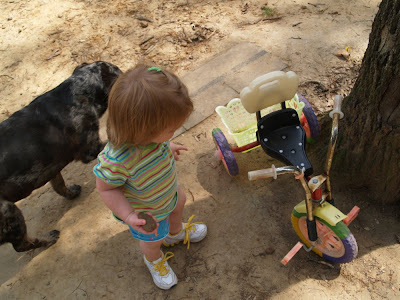 Esme's new 'bike' (tricycle) from the flea market. 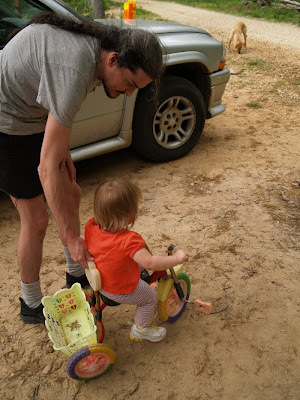 She already loves being pushed around on it, although she can't push the pedals yet. We didn't go to library hour this morning. 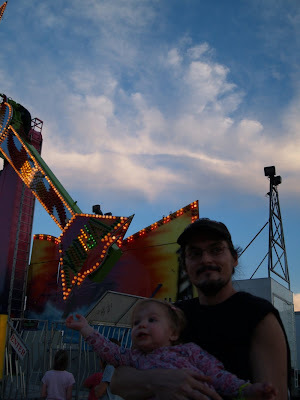 I was having too much fun just being with Esme and we were planning on going to the carnival in the evening. Esme tried to wash stuff (rub rub while holding a washcloth up against something) and was interested in when we loaded and ran the dishwasher. 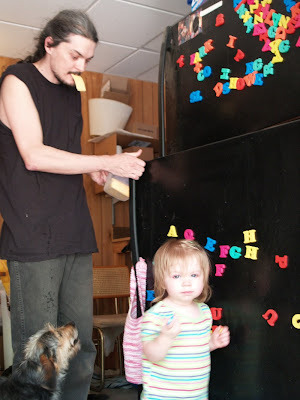 She also pointed to the oven light left on from breakfast and said 'pizza' and played her letter herding back and forth across the room and in and out of a five gallon bucket. We went to see Grandma for just a very short amount of time on our walk and then Daddy made beef stew for lunch. 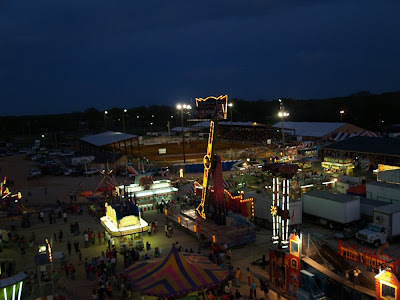 After that a nap, and then up and out to the World's Biggest Fish Fry carnival. Daddy got some cheese out of the fridge! We got Esme an easel and bike at the flea market. She loves them both! 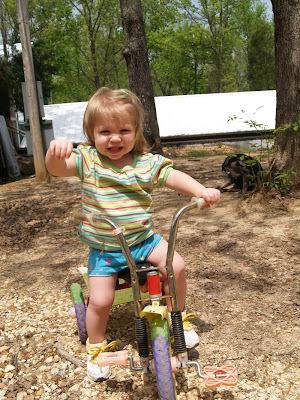 She can't move the pedals herself on the trike but she loves me to push her around on it. 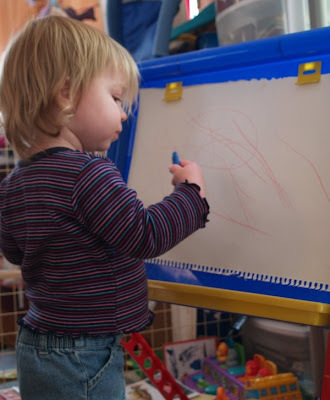 She is drawing lots of pictures on her easel and knows the paper goes under the clips at the top. 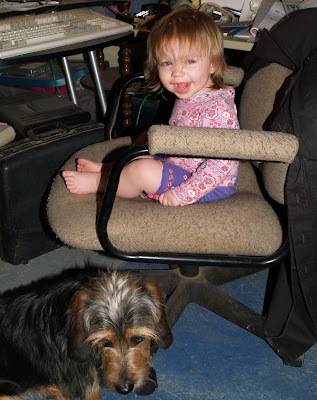 Also today she was climbing in and out of Daddy's chair just like she does with the kitchen chairs downstairs. 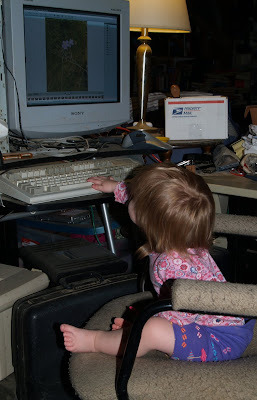 Except - one time when she got up and turned around she caught me watching and said 'I chair!' hehe - yes you do little one! We get up early on Tuesday morning, grab some bread for breakfast and get out the door soon after sunrise! 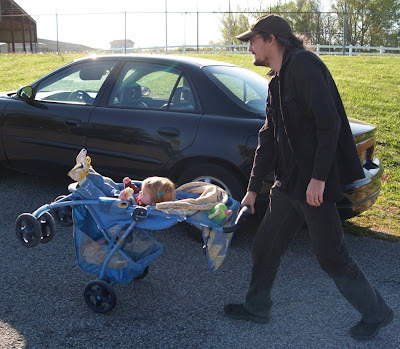 Daddy pops a wheelie with the stroller! This art easel was a buck! And this beagle mix puppy was free. I'm a sucker for a cute face, aren't I? Today started out funny - Esme woke up from the night but didn't stand up and yell like usual. Instead she read a book, and kicked the side of her crib for a while. Then she sat up and pointed at the letters on her crib fabric and said 'E'. Her crib fabric has letters and animals on it - and I named them for her. She said 'E', 'meow?' 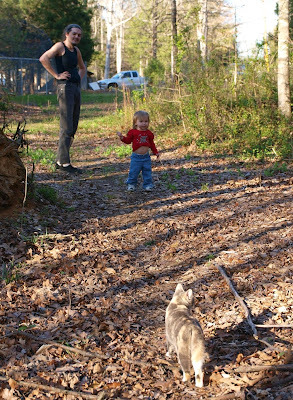 (there was a kitty) and pointed to things to be named. Then I put her in the changing table and she pointed to a box behind her head and said 'E, O' - and she was pointing to numbers that said 1041. What a funny kid! She also told me the doggies were barking and kitties say meow etc... her normal jabber. When I was putting on her pants near the dresser she pointed at the shelf and said 'foo!' -- she wanted her shoes which were on the shelf, so we put on our shoes. I was pretty impressed! We did our bath and brushing teeth - she's trying so hard to mimic me on everything! 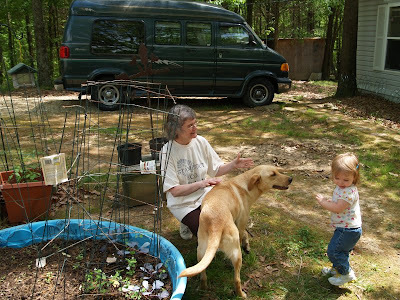 We went to town and stopped at yard sales - she waved hi and bye bye to lots of people. When we stopped for a snack she stood in line with us and said hi to lots of people while holding Daddy's Skittles in her hands. She talked to lots of ladies and impressed a few. She devoured a piece of chicken and potato. 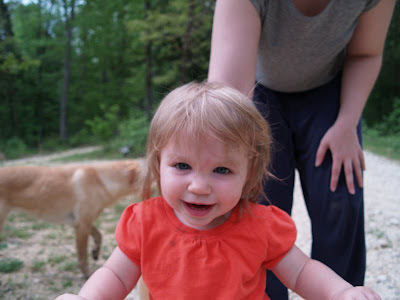 She saw two little girls at one yard sale place but they were eating at a little table and were very unwelcoming (not to blame them - they had pizza and Esme was interested) We bought Esme a few more dinosaur toys and she loved seeing all the trees and grass. 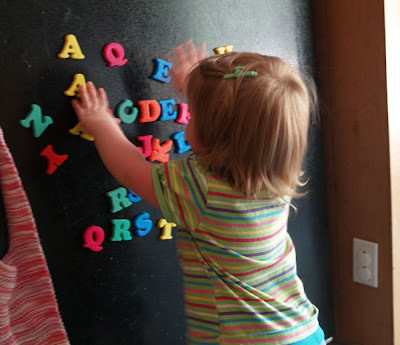 When we got home Esme played a weird sorting game with her fridge letters. 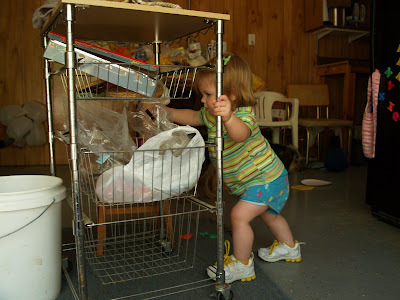 She brought them all to her stepstool one by one, then moved them all behind the stove, then brought them back to the stepstool, then sorted them mostly by color, then dropped them through the hole in the stepstool saying 'uh oh'. 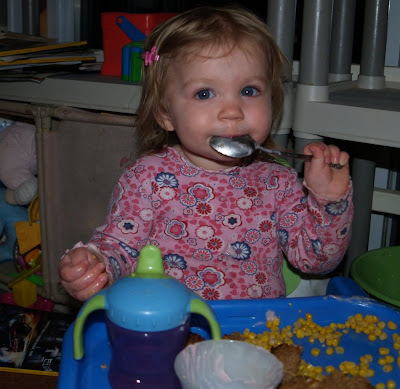 We had some sherbert with spoons and chips and cereal - which she enjoyed. She got very upset when she almost dropped the glass bowl and I told her 'uh oh NO (don't drop this)' She helped me with laundry again. When we got upstairs again she wouldn't leave the kittens alone - tried to give them a brass plant hanger after I told her they didn't need it. She went down for a nap. Mark is planning spaghetti with really good tomatoes in it. Last night after I got home from work we made a small pizza, and Esme was really happy to watch it cook in the oven. She kept saying 'look at that!' and pointing to the pizza in the lighted oven. She ate almost all she was given. 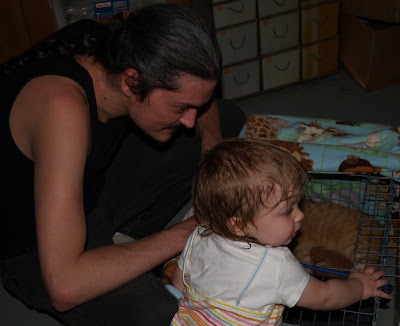 She also made sure Daddy knew that we kept cat food in a cupboard. She does this to me all the time (opens the cupboard and points at saying 'meow?') He was pretty impressed because he hadn't seen her do that before. Esme is learning 'patty cake' which is very cute. 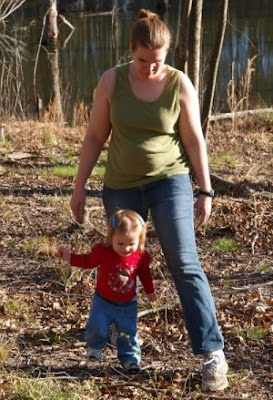 She even tries to hurry me along by moving my hands for me.. silly kid! She also tried to help me put together her 9 piece puzzle by sliding the pieces in so the straight edge faced out - it was in the wrong place but she had part of the idea down. It is a durable puzzle and I've caught her putting the pieces on the board but not with any luck yet. The kittens seem to be doing just fine - active and Mitzi is taking good care of them. Mitzi lost one more of her kittens - the lightest colored one. He had gotten less and less active since his birth and was hardly moving at all tonight. He had been second born just after the breech birth. 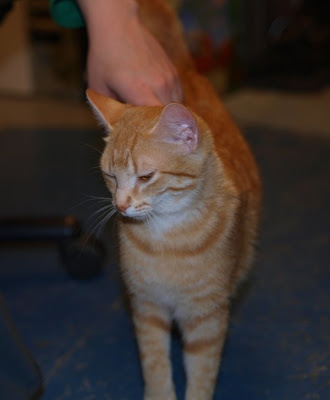 Mitzi had chosen today to separate him herself from the other three and wouldn't take him back. Mark took a closer look at him and he wasn't formed quite right around the nose. 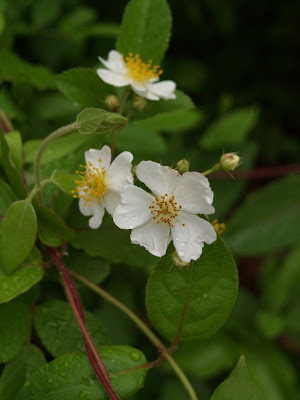 We have to trust Mother Nature knows what she is doing and he just wasn't meant to make it. Misha is not completely alright either - she is limping and reluctant to get up since her return yesterday. Mark is thinking about giving her a bath to see if her black fur is hiding unseen injuries or cuts. Bunny seems to be healing alright - her bad eye is open now and she has been easier to take outside. We still don't know what happened to them. Nicer news: I've been meaning to say that I started brushing Esme's teeth just before her bath, in the bathtub. I usually grab her and hold her down to wash her face and hands well just after dinner and give her a bath after that. Since I couldn't convince her to brush her teeth or let me brush them for her otherwise - I put that step in between washing her face and letting her play with her bath toys. So far it's working pretty well. 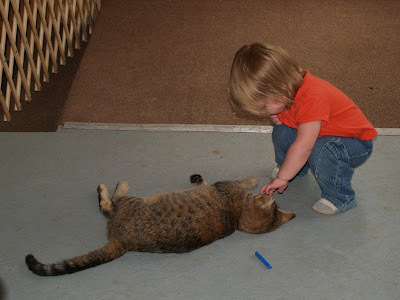 Instead of being upset Mitzi stretched out more and 'talked' to Esme in meows. We didn't understand all of it but Esme and her had a back and forth conversation about the babies. 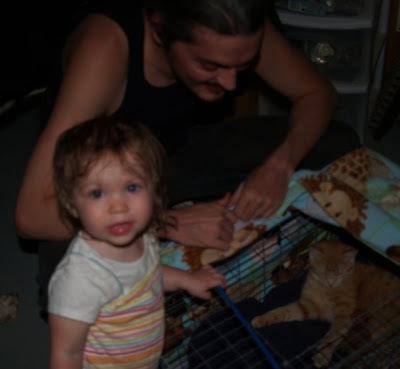 Esme pointed at the fuzzballs and chattered in her baby talk but didn't try to pick them up. 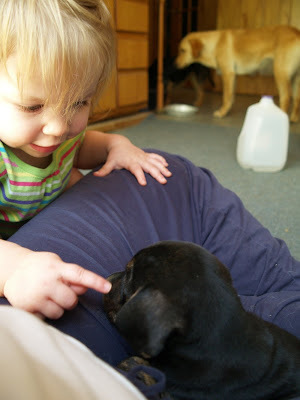 She pointed at Mitzi's nose and the babies ... would really like to have known what they said to each other! Are you sure those are kitties too? Oh wow, what an Easter day. It actually started yesterday after Mark picked me up from work. We came home to a bloody porch and a severely torn up Bunny dog. We have no idea really what happened to her - deep small punctures all over her face, chest and under one leg. We thought she had lost an eye at first - but it's still in there. What was worse, in the middle of cleaning Bunny up and seeing just how many wounds there were (and what was just blood) we did a head count, and Misha was also missing. It was a stressful night thinking we were going to find a dead dog in the morning out in the woods - and caring for the hurt one as well. 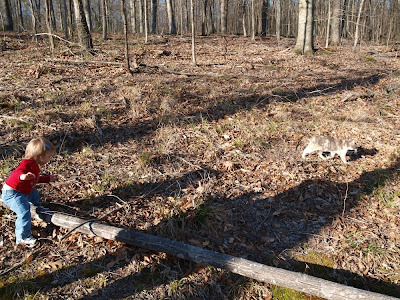 Early this morning Mark went out and walked the woods, but didn't find any sign of Misha or what had torn up Bunny. 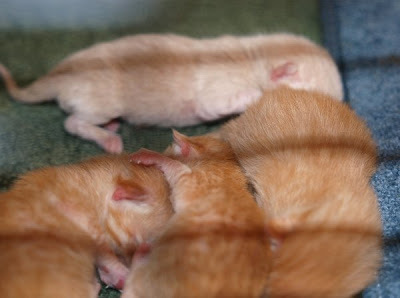 At about 9 am our cat Mitzi began to have her first litter of kittens. The first was born breech and stillborn, it never moved or took a breath. Since then she has had four more and seems to be doing well with them. 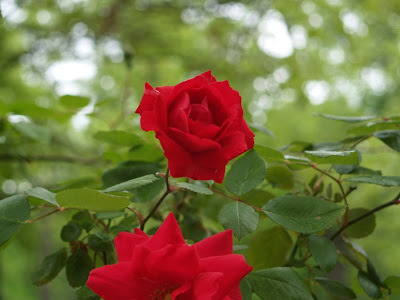 It took a bit of urging for her to take care of the first two live ones after the disappointment and confusion of the first one being stillborn. 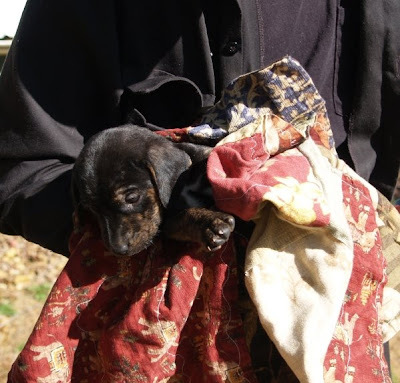 But with some soft voice and lots of 'good girl' she took them to nurse and things were a lot easier after that. what a surprise, they're orange! 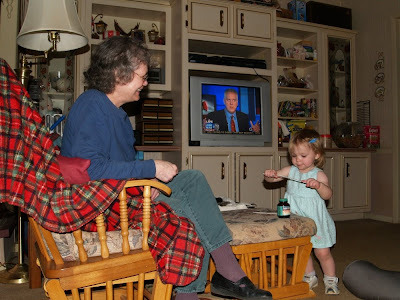 I took Esme up to see her Grandparents and they had a good time with plastic eggs and running around the house. She made up her own game with Grandma where she falls onto Grandma and gets hugged - very very cute. We came back home, had some lunch and she took a nap. The rainstorm started - a big heavy downpour. And in the middle of it I looked up and there at the door was Misha. She was wet and looked like she had been running all day and so tired she just wanted to lay down. But, she doesn't seem to be hurt anywhere. She came right in the house soaking wet and went immediately to where Bunny was laying. She looked her over and laid down nose to nose - almost a 'sorry you got hurt glad you are okay.' We dried her off and they are both sleeping on a blanket. What a relief. Misha is the 'brains' for all of our dogs it seems some days, the one who takes care of everyone and knows how to translate human. I would have missed her the most, I think, out of all of our critters. So, a happy ending even with poor Bunny torn up. Mark is taking good care of her - nearly carrying her outside when necessary. Mitzi is taking good care of her kittens so far, and finally after sunset on Easter it seems we have a little Peace falling on our house. Esme helped me put stuff from the washer to the dryer today. I had taken everything out of the dryer and showed her it was dry - and she always wants to close the dryer door then. I opened it again and put some wet clothes in - and showed her the clothes were wet and the ones we pulled out earlier were dry. She put the dry shirt in the dryer and turned around to point at the washer. I started giving her more from the washer and she put them in the dryer like a good little helper. Finally I said we were all done and she was a little upset about that but happier when it meant we could close the dryer door again. She saw her big rag dolly on the floor of the laundry room and was going to pick it up but I told her it needed to be washed and she was sad but left it there. He's in the washer now and needs to go in the dryer. We went to town with her yesterday and showed her lots of flowers in the greenhouse at work. She ate some French fries and got a red Gerbera daisy from a coworker of mine. She also smacked her forehead yesterday after we got home from town, making a bruise on one side of her head to match the one on the other side of her nose she had gotten a few days before. What a kid! She's alright and on the mend though - just trying to look like Rocky at a young age. 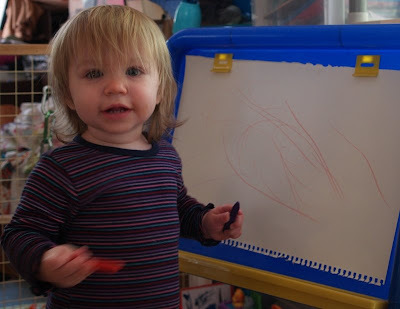 Her other big thing started yesterday: She's been going around the house since then singing 'deedle deedle deedle' We have no idea where she got that from. Esme still weighs about 25 lbs, and still isn't much taller than 30.5 inches. 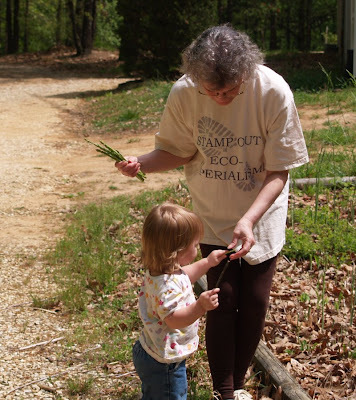 They say they slow down in the growth about this age and pick up again a little later. 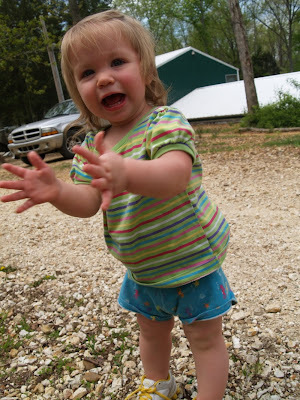 Her feet have gotten bigger though, she is up another size in shoes, again. Pretending! : Not only pretending things are phones now, but also pretending blocks are food she is 'eating' with lots of lip-smacking and throwing the 'eaten' block away etc etc... 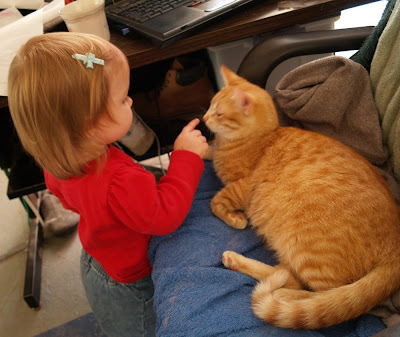 Likes to hug her pretend stuffed kitty now and point to it's nose and eyes. Also points to the nose of her real kitty (like the picture above). She asks for lots of treats by pointing to the container or bringing it if she can reach it.. trying to get her to say the treat name but needs more work on that. 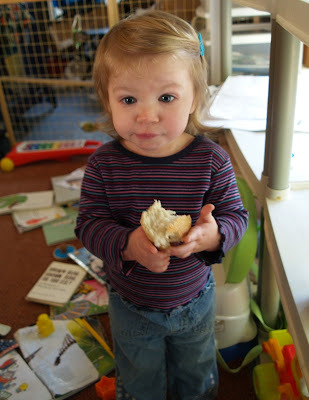 She was pretty good at saying 'skittle' but we stopped giving her those because she wouldn't actually eat them anymore! She's really good at using a spoon, no luck with a fork and very little success with a 'big people cup' instead of a sippy cup. She pretends to drink out of the real cup and smacks her lips but spills more water than she drinks and then gives up. Practice Practice! Likes to page through her books by herself and brings them to us to read. Points out every possible picture of a kitty while saying 'meow?' Points to letters on things and on 'Starfall.com' and says 'E' Tries to sing ABCDE then loses her place. 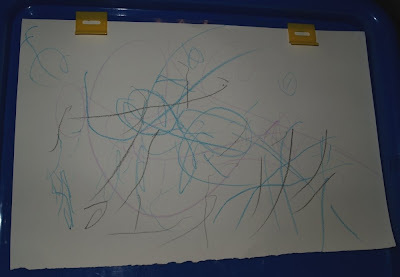 Knows where her crayons are and where the paper is kept and will ask for each of them in order to draw. 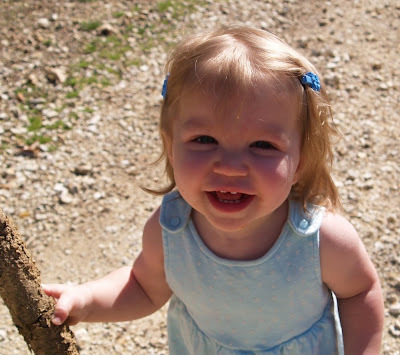 She loves to go outside. Understands she needs shoes to go outside and will bring them to me as a signal 'go outside please?'. If I put hers on and still don't get up - she will bring me my outside shoes as a nudge. Understands varying degrees of 'no'. Still hasn't actually said 'No' herself. She understands so much more than she can actually say and can follow lots of directions when she feels like it. I'll be working for the next seven days so we took a lot of pictures today! 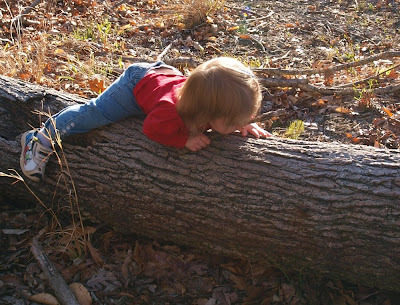 This log is in the way! We told her she was such a good girl for getting over it all by herself! All Done - Go home now! 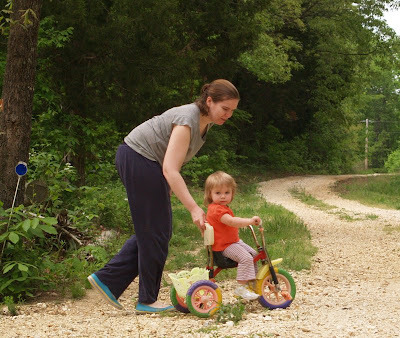 She is positively running - fast, but that doesn't mean she doesn't fall over things doing it. 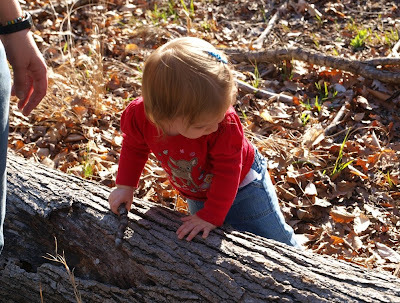 She is climbing up and over logs, into chairs and doing so much better on the stairs. We still need to supervise the stairs though, because she thinks she can go down frontways and upright - because she can on the outside stairs. The inside ones are too steep for her right now though! She's getting so good with a 'big people' spoon! 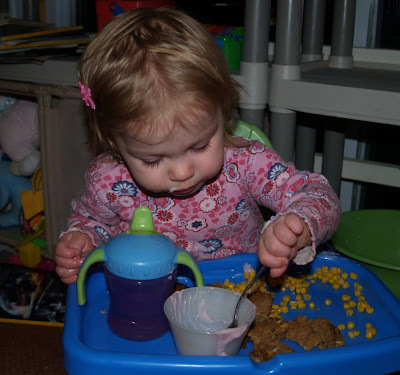 She still manages to make an extreme mess with baby spoons but 'big people' spoons are great!